No, the blog hasn't been hijacked by Supermarionation fans! Gerry and Sylvia Anderson's characters will appear on the first of Royal Mail's output for 2011, Children's television. 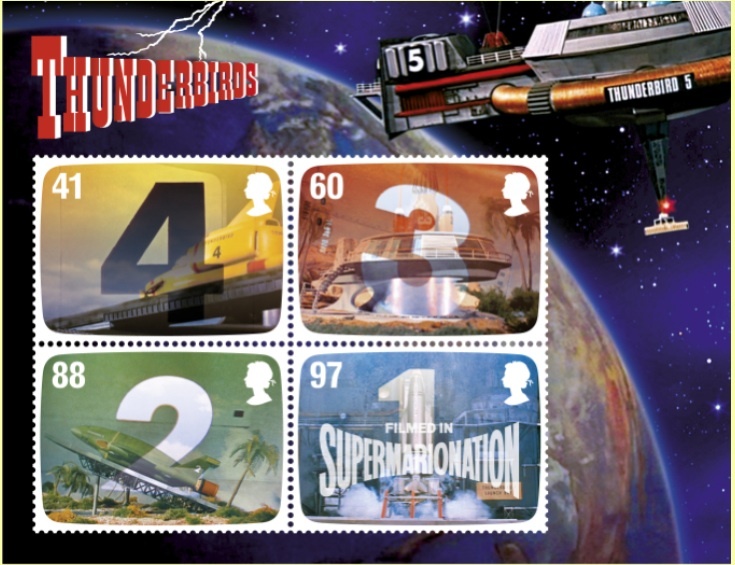 The miniature sheet shown above features a first for Royal Mail, lenticular printing, showing the Thunderbird vehicles in their launch sequences. In addition to the MS, there are separate stamps, one for each of the TV series that were so popular back in the 60s. There will also be a self-adhesive retail booklet containing 2 x Thunderbird stamps and 4 x 1st class gold Machins. The latter, of course, should have a year code of MA11 so will be in demand by Machin specialists. See this and more details about the stamps on our webpage. Edit: See the lenticular stamp sequence and more about the issue on the Creative Review blog. In this month's Stamp Magazine, editor Guy Thomas writes in his leader that television now seems to be dominating the stamp programme, with Wallace & Gromit in November for Christmas, Gerry Anderson in January, and Thomas the Tank Engine in June. Certainly this poses insurmountable or very expensive problems for first day cover producers and the sponsors of special postmarks, due to requiring permission from copyright owners for showing anything remotely connected with the subject matter. As you can see from the special postmarks published yesterday for the Wallace & Gromit Christmas issue, producers are now avoiding the issue altogether and their covers and postmarks have only a remote connection with the stamp subject. This is one of the reasons why Norvic Philatelics stopped producing our own design FDCs (the other being the sheer number and insufficient time between stamp issues). Now Steve Oliver has decided that it is time for Phil Stamp to close his album, and there will be no more PhilStampCovers after the end of 2010. Farewell Phil/Steve, you have given us some laughs and produced some very attractive covers in the last 10 years. And how will this affect your collecting? Certainly if your theme or topic is 'television' or 'entertainment' there is much to add to your collection, certainly in 2011. But if you are a completist Royal Mail just doesn't want to know. They are supplying collectables to an increasing number of discreet groups of people, but certainly to fewer and fewer long-term GB collectors. I suspect that even Machin specialists will eventually pull the plug on the succession of year codes. Interesting stuff, more and more commercial tie-in issues seem to be appearing. I'm not sure that this booklet would have MA11 - surely the code is for print date rather than issue date, or have I got that wrong? Maybe what happened is this. Royal Mail started the date code late last year, but with their usual great concern for collectors (tongue-firmly-in-cheek here), they decided not to do 09 for a very brief period and simply started with 10. In that case, 11 may not show up until we get stamps that are printed after January 1.